Are you searching for the best electric pencil sharpener that would not chew your pencils? Well, your quest for the perfect pencil sharpener is over! You've found them already - Our high quality electric pencil sharpeners! If you have been struggling with hand sharpening pencils, but ended up with a broken tip, rather than a smooth, perfect point, then you need our electric sharpeners! Our electric pencil sharpeners are the best available in the market right now and a sure hit with pupils, teachers, students, artists, colleagues, mom, dad and every other family member! BEST VALUE: Offers higher value than other brands and manufactured with better quality in mind! DURABLE: Built to last and will withstand a class of 40, 9-yr-olds jabbing at it all day long! LARGE SHAVING TRAY - The pencil shaving reservoir is large enough. Hence, there would be no need to empty it midway into your class! AUTO STOP FEATURE - Automatically stops working when the pencil is evenly sharpened to prevents the sharpener from eating your pencils! PERFECT FIT - Sharpens ALL standard sized pencils! MULTIFUNCTIONAL: Our professional electric pencil sharpener is ideal for use in the classroom, office, studio or at home. ELECTRICAL POWER - Powered by electricity so removes the need to manually sharpen pencils. 1 x Electric Pencil Sharpener. Convenient AUTO STOP feature - We understand that you need to sharpen your colored and #2 pencils so we are offering you an electric pencil sharpener which AUTOMATICALLY recognizes the presence of an inserted pencil, switches on and AUTO STOP once the pencil is fully sharpened! STEEL BLADE CUTTER FOR PRECISE SHARPENING - Unlike other sharpeners that produce lopsided pencil points with leftover wood, our high-quality pencil sharpener is designed and engineered specifically to produce exact, evenly-rounded pencil points every time. This is the perfect electric pencil sharpener for classroom, home or office. COMPACT DESIGN WITH LARGE SHAVING BINS - Each of our electric pencil sharpeners comes with a compact shape which does not take up space on your desk. Its heavy duty, high capacity, easy to clean shavings tray can take up to 100 pencil wrappings before requiring you to take it out and empty it! An auto safe feature prevents the blade from running when shaving tray is out to prevent injury! DUAL POWER SUPPLY - Are you thinking of how to manually sharpen the pencils of about 50 scholars in your class? 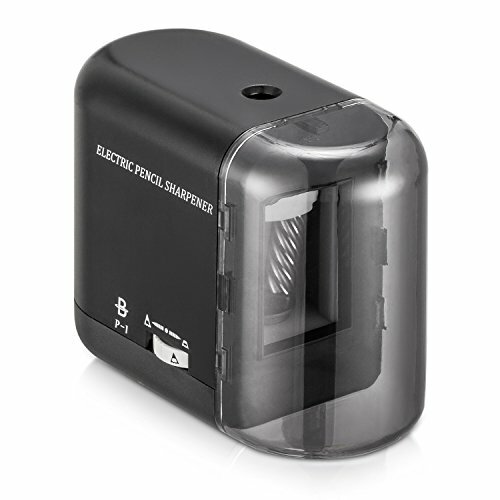 We thought of that and made sure our heavy duty pencil sharpener is powered by an AC adapter or batteries (NOT INCLUDED), so that you can use the device straight out of the box! GUARANTEED SATISFACTION: We spent countless hours designing this high quality pencil sharpener. It has convenient features that make it safe to use even around kids for guaranteed safety. We are confident you will love it. Click 'Add to Cart' now and get this pencil sharpener for your classroom, office, of home.